Not so many years ago, Venice was a city of neighborhood alimentari or grocery stores, cheese shops, meat markets, and produce vendors. Supermarkets were few and far between. 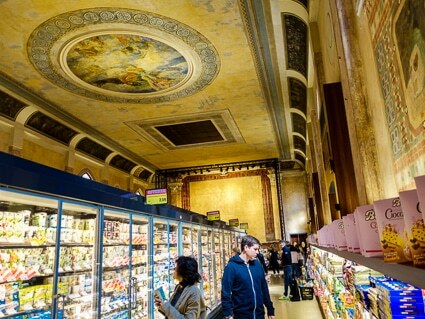 Times have changed, and today you'll supermarkets in most of Venice's sestieri or districts. That's bad news for traditionalists, but it's good news if you're a foreign tourist who's intimidated by unfamiliar shopping customs and language barriers. Shopping at a supermarket can be a time-saver when you're stocking the refrigerator of your vacation apartment or browsing for snacks to keep in your hotel room. It also lets you mingle with the locals in an everyday, real-life environment. Of the supermarket chains in Venice, one of our favorites is Despar, which had three stores the last time we checked: one near the railroad station that caters mostly to tourists, another close to the Rialto Bridge, and its Venice flagship store in a renovated cinema east of the Guglie Bridge on the main pedestrian thoroughfare between the station and the Piazza San Marco. Despar is the only supermarket in Venice with consistently good breads, rolls, and pastries, which you can buy from plexiglass bins toward the rear of the store. Another popular chain is Coop, which has more supermarkets in Venice than any of its competitors. The largest stores are located just off the Piazzale Roma (near vaporetto platform "A") and on the Strada Nova, not far from the Campo SS. Apostoli in Cannaregio. Small and medium-size Coop or InCoop stores are scattered around the city center and on the glassmaking island of Murano. Coop (pronounced "Cope") is especially notable for its high-quality and competitively-priced store brands. Conad has several stores in the centro storico and on the Lido di Venezia. Two of the biggest are on the Zattere, facing the Giudecca Canal in Dorsoduro, and another in the far northwestern reaches of Cannaregio, where you'll find what may be the biggest and least crowded supermarket in Venice. Other supermarket brands in central Venice include Punto (with stores in the San Marco area and the Campo Santa Margherita), Prix (a discount chain with a handful of stores in neighborhood locations), and Crai (with two small Venice stores, including one on the Campo San Tomà in San Polo). When buying produce, you'll often need to put on a disposable plastic glove, fill a plastic bag, and weigh the bag on an electronic scale that has icons representing various fruits and vegetables or--in some cases--product numbers. Select the icon or enter the product number, click "OK, wait for the scale to print a price label, then stick the label on the plastic bag. Some stores have a similar system for unpackaged rolls, breads, and pastries. If the product is sold by the item, rather than by weight, a secondary virtual keypad will pop up on the screen. Just enter the number of items and click "OK" to print a label. At deli counters (or in independent meat and dairy shops), you buy cold cuts and cheeses by the etto or 100 grams, which is just under a quarter of a pound. For example, if you want 200 grams of prosciutto, point at the ham and ask for "due etti." Newer supermarkets have self-service checkouts in addition to the usual checkout lines. When a store is busy and you're buying just a few items, it may be quicker to use the automated checkout. You can pay with a credit card, banknotes, or coins, and the machines issue change. Supermarket shopping hours vary, although nearly all stores are open every day of the week. Neighborhood stores may close at 8:30 or 9 p.m., while stores in busy locations such as the Zattere or Strada Nova are usually open until 9:30 or 10 p.m. If you dislike crowds and get frazzled by long supermarket lines, try to avoid shopping during the evening rush. Pets are supposed to be left outside the store or in the store lobby, but don't be surprised if you see the occasional shopper with a small dog in a basket or tucked into a jacket. Finally, a handful of supermarkets (such as Despar) require you to scan your register receipt to leave the store. Keep your receipt handy after you've paid, and hold the receipt's barcode against the infrared scanner at the exit gate. The gate will then open to let you out.